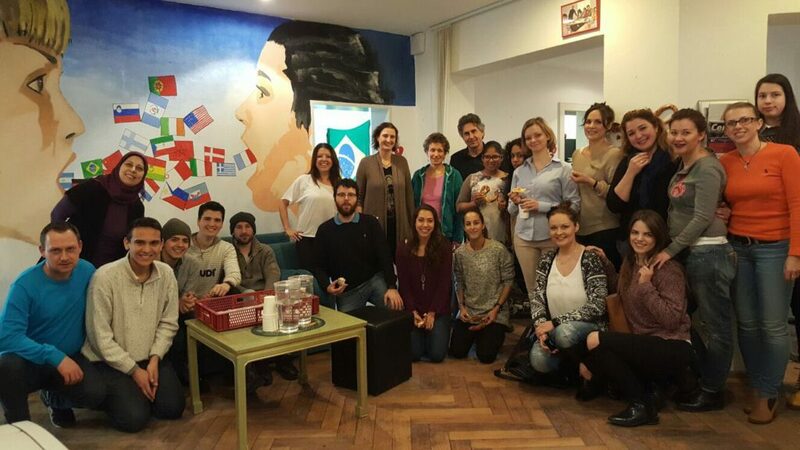 Visit our language school in the city center of Stuttgart! You can reach us simply by subway (Berliner Platz) or use our underground parking with 300 places in Schlossstraße 49! Our language school in Stuttgart is offering you language courses in German. There are many good reasons to take a German course in our school. We teach in small groups of 5 to 12 students. The courses are guided by our qualified and native speaking teachers that will guide you through all levels of A1, A2, B1, B2, C1 and C2. Every month we start every level for beginner and advanced! Well grounded German language knowledge is of the utmost importance if you want to live and work in Germany. Through those you gain access to the German culture and the German way of life. Furthermore are German language skills the basic requirement for the preparation for college or a career entry. We prepare you in one of our intensive courses for the TestDaF (exam German as a foreign language) or Telc. Should you – as of now – have no knowledge of the German language, you are in the right place at the Sprachschule Aktiv in Stuttgart! Experienced teachers will help you to express yourself and converse with others in just a short amount of time. Should you already have basic knowledge, we offer you courses in all levels. You can choose between course levels A1, A2, B1, B2, C1 and C2. It is not always easy to decide which level is the right one for you, in which case, we offer you a placement test. They are available online. Should you have time and you want to visit our school you – of course – have the option to take the test in our language right here, in our school. All our teachers are native speakers and have several years of teaching experience. Our teachers prepare you specifically for the German courses and structure them on TestDaF and Telc exams. Since our lessons are held in small groups of 5-12 people, our teachers can tailor them to the needs of the students. It is important to us that you feel comfortable in our courses, have enough time to try out what you have learned and gradually reach the next level. Our young and motivated teachers will assist you. Support outside the regular class is a pleasure for many of our teachers. Likewise, personal and school problems are addressed and solved together. As part of our leisure program, you will also get to know our teachers and staff better.This way the time you spend with us inside and outside the school contributes specifically to language development. That you can register for one of our courses without worry, we offer you the opportunity to test it first. You can participate in a free trial lesson without any obligation. You have the opportunity to meet your prospective teacher and get your own view of our performance. If you are not satisfied with the course for any reason, you will get your money back. Of course, our team is there for you during the course. If you have a question or problem, contact either the teacher or one of our friendly staff. Depending on the goal you want to achieve, we offer you different course models. In a small group – meeting 2 to 3 times a week – you might not learn German quite as quickly, but you will have more time for things outside of the course. This is also more convenient for those who work during the day. While attending the school you will to know like-minded people and attain friendships that often last long past the duration of the course. Faster progress is possible with an Intensive or Semi-intensive course. These courses take place every day. You can surprise your friends, colleagues and family with your daily progress! For free spirits that also want to make quick progress, private lesson are the perfect option. We have a number of German teachers who would be glad to come to your home to teach you there. We take care to ensure that classes are conducted in small groups. This is important for any language course, the emphasis being on appropriate time to for each student to speak as much as possible. Learning a learning a foreign language takes time and practice. Learning to speak among a group of peers will help you develop the confidence it takes to go out and practice further what you have learned in the classroom. Our German teachers are there to monitor your progress and correct mistakes. With the introduction of various real world topics, learning a new language is not only quick but fun. Come anytime and try our free trial hour. Experience for yourself the quality of the service we provide. Should you have paid and are not satisfied let us know and we’ll refund your money. Our location in the center of Stuttgart at the Culture and Congress Center, the Liederhalle and the shopping center Bosch Areal is the perfect place for your language lessons! Directly below our school is the underground car parking Schlossstraße with 295 parking spaces. The underground car parking offers a reasonable parking tariff of 1.70 € per hour if you arrive by car. If you prefer to travel by subway, the Berliner Platz stop is just around the corner. Use lines U2, U4, U11, U14, U29 or U34. The Berliner Platz stop is only one underground stop away from the main train station and only one stop away from the city center of Rotebühlplatz. The Culture and Congress Center Stuttgart is one of the largest and best-known event locations in the capital of Baden-Württemberg. The Bosch Areal as a center for media, art and culture, shopping and entertainment is also in the immediate vicinity and a trendy address in Stuttgart.